Are your words in agreement with your actions? Even if the aforementioned verse addresses some among the Children of Israel, it contains an indirect warning to Muslims as well.The main emphasis here is on the agreement between one’s words and actions. It is what the verse: “Why do you say what you do not and will not do?” (61:2) states in a different style. 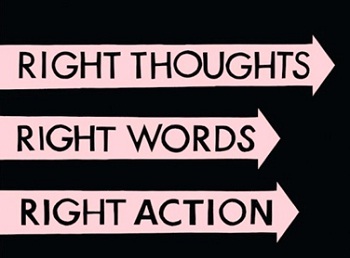 Words and actions are an important, two-dimensional tool in the conveying and exalting of what is right and just. When these two dimensions are combined in proclaiming and supporting the truth, the result becomes fabulous. A person must personally practice what he advises others lest he contradicts himself. A person, first of all, should put what he or she believes into practice and vocalize his or her own assimilated feelings, practices and concerns. For example, if a person does not perform his prescribed Prayers in full awe of God, he should not talk about the perfect Prayer. In the same way, if a person cannot do an unconditional favor, or cannot become self-sacrificing, he or she should never mention living for others. Out of His wisdom, God Almighty has made the influence of the advice dependent on its sincere practice by the advisor. For instance, the activities of some to guide others in the name of Islam or to defend Islam and refute allegations against it are of no use due to their lack of sincerity. These people may even abandon their former opinions and positions and show inclinations toward the views of the opposite side. Islamic scholar Mustafa SabriEfendi (1869–1954) explains this situation as follows: “These people are not sincere in what they narrate to others, what they write in their books and in their apologetics about Islam. If they were sincere, they would be living in accordance with what they tell others, and not frequently change their views, acts, and position”. They have not lived in accordance with what they preach; they have suffered hesitations. Hence, they have rendered their followers hesitant. Consequently, even though the books and apologetics have been written to serve Islam, they have thrown minds into confusion and given rise to different irrepressible chaos in the places they have been published.Because of this, one should explore the ways of becoming sincere and influential in serving Islam. Actually, these ways are sound knowledge, sincere practice, employing efficient methods, recognition of the addressee, and determination of what things need to be told, where they need to be stated and how they need to be expressed. Each step is significant on its own. In order for all these acts to be effective, one must have utmost sincerity; whatever one does, it must be done purely for God’s sake and to serve Islam. Another issue that needs to be taken into consideration is the possibility of misunderstanding the verse:“Why do you say what you do not and will not do?” (61:2).While this verse includes a condemning questioning, it never bans preaching what is not practiced. For just like practicing, preaching or giving guidance is a form of worship. One who neglects both commits two sins; therefore, we should both practice and preach. And in order to be effective in preaching, we should sincerely practice what we preach to others. While trying to encourage people to good and prevent them from evil, one’s neglect of oneself is an obvious contradiction. This kind of contradiction devaluates the truths preached as well as the ability of expression, eloquence, and knowledge.Thus, the conclusion of the verse reminds us that a wise person is not expected to fall into such error. Therefore, preachers, counselors, advisors, guides, authors and broadcasters have to be careful about their work so that people take them seriously and so that the subjects they relate remain valuable as well.Moreover, we should not act wrongly and inconsistently for the purpose of guidance and thus be defeated by those who speak and act consistently on the way of misguiding.